Do you have a big date, an important interview, or a special event like a wedding coming up? Not sure whether to wear that cute dress with the strappy heels or that sleek pants-heels-and-jacket combo, and want to get input from friends? 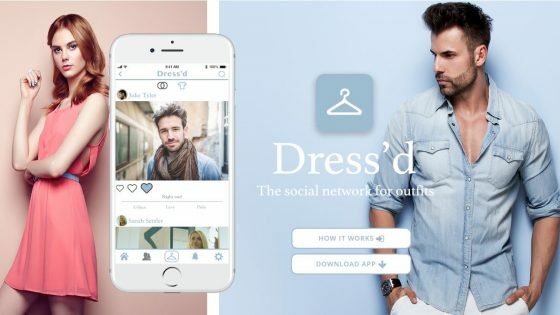 Instead of spamming your Facebook or Instagram feed with pics of your outfits, try Dress’d: the social network for outfits. Dress’d is an outfit-centric social media platform where users post outfits, bringing everyone’s outfit and clothing pictures to one platform and letting people help their friends decide what to wear on the daily or for special occasions. Based in Philadelphia, Pennsylvania, the app lets users add friends, select styles, post outfit pictures as well as like and comment on outfits, documenting your style and also helping friends decide what to wear. Dress’d aims to become the go-to app for outfit posting, and lets you document your style by posting your outfits, selecting styles and brands, and growing your profile in the process. The app also connects you with your friends when you are deciding what to wear, whether it’s for a party, an interview, prom, or just buying clothes at the mall. Simply take a pic of the outfit, and instead of posting it as a normal post, select an expiry time to alert your friends and get their feedback before you need to make the outfit decision. As one of the app’s founders said, “Deciding between two pairs of shoes at the mall has never been so convenient! You can download the Dress’d app for free as long as you have iOS 10 or above – but not until it launches in the Apple App Store on November 19th at 5pm EST, and only if you’re located in the US, Canada, Australia, South Africa, United Kingdom, or New Zealand. Android users (myself included) and fashionistas located in other countries will have to wait and hope Dress’d will be available for them soon.